Product prices and availability are accurate as of 2019-04-12 05:24:44 EDT and are subject to change. Any price and availability information displayed on http://www.amazon.com/ at the time of purchase will apply to the purchase of this product. 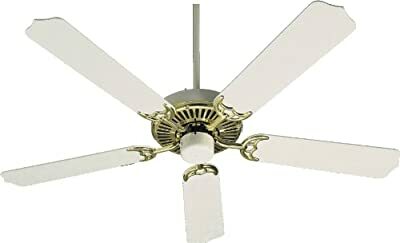 Quorum International 77525-26 Capri I 52IN Ceiling Fan is the original value priced ceiling fan. The Capri I series is truly the quintessential fan style with its classic blade holders and simple style in an elegant Polished Brass and Gloss White finish and matching White blades, making it a timeless collection that will be appreciated for many years to come. The 77525-26 is 11.25IN high using the shortest down rod included. The 5 included blades have a 11.5-degree blade pitch and a durable 153mm X 15mm motor size. The energy used on high speed is only 69-watts and it has airflow of 5152 cubic feet per minute with an airflow efficiency of 75 cubic feet per minute per watt. The 77525-26 comes one per package, includes 5 blades, one 3.5IN and one 6IN down rod and is operated using a pull-chain that will work the 3-speeds and reverse. Optional controls are available and can be purchased separately (not included): 7-3000 Hand-Held remote, or 7-1401-0 Hand-Held remote control. For over 30 years, Quorum International has been in the business of treating our customers like family. Our award-winning customer service will always be there to help create the perfect space you want. Quorum International - Make your home come alive with light and style. Welcome to the world of unique, exclusive lighting and fan designs that will not only set your space apart, but will also bring the look and feel that you have been searching for.